I recently had a requirement to update a SharePoint list based on a Date and Time field. The list contained two important fields: the Date and Time field called ‘Hire Date’ and a field called ‘Active’. The goal was to update the list item when the ‘Hire Date’ field was equal to today’s date and change the ‘Active’ field to false. This is simple in a workflow, however, the item was NOT getting updated when ‘Hire Date’ was equal to today so there was no way to trigger the workflow. A simple alternative is a .NET console app that runs every day using Windows Task Scheduler. The app itself is simple, it uses CSOM to get the values of the item and updates the Active column when appropriate. And most importantly, I’m not using a Custom Timer Job. SharePoint Timer Jobs, particularly custom ones, can be resource intensive strains on your SharePoint server. If your SharePoint server is already strained for resources, like ours, console apps are a quick and efficient way to check for and make updates to SharePoint Lists. Once this was done, we ran a Full sync of the User Profile Application Service but the disabled account still showed up in search. Why? We needed to run a Full Crawl of Local SharePoint Sites as well. Once that completed, the disabled IT accounts were gone. Recently I stumbled on an interesting problem: I needed to open and modify a list in SharePoint designer. So, I opened the list and found that designer gave a generic “There are no lists to show in this view” message. However, this particular site had over fifty lists that I could clearly see in the UI. The solution, which I found here, was a list that had been deleted was showing up. As the blog suggest you can use a REST call to your site http:// [sharepoint] / [site] / _vti_bin/listdata.svc which should give you some XML, append a list name to this http:// [sharepoint] / [site] / _vti_bin/listdata.svc/ [list name] and with a little hunting you should be able to find your broken list. I was able to find it by trying to open the list through the browser and see a “This page does not exist” error. From here, the list can be deleted. Finally, close designer and clear your webcache, reopen designer and you should now be able to open your list in designer. I believe this may have occurred in our migration from 2010 to 2013. The site in question had several outdated and unused lists that needed to be cleaned up and/or deleted. The link to the list seems to have persisted even though it no longer existed and this prevented designer from open the site correctly. Another frequent UI correction is to remove the column title in Grouped By views. By default, the Grouped By view will group items together that share a field value. 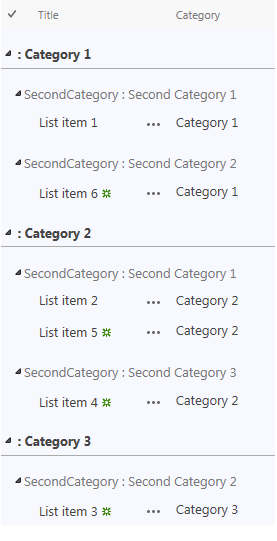 If you have several items, each with a field called Category and a field value of Category 1, those items will be grouped together. The below items have two fields: Title and Category and are Grouped By Category. 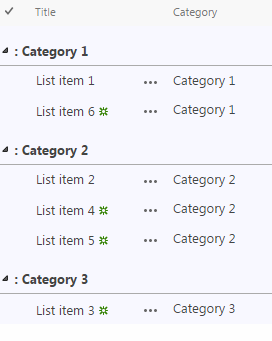 So all items with Category 1 are grouped together, all items with Category 2 are grouped together, etc. 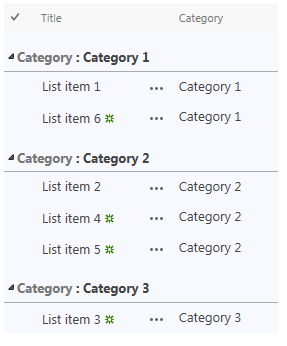 The goal here is to remove the word “Category” in each grouped section of the Grouped By View, leaving only “Category 1”, instead of “Category: Category 1”. The above function accepts a string to remove and iterates through the each grouped section and removes the text in textToRemove. This text should match the text you want to remove exactly, in the above example textToRemove should be set to “Category” to remove the text Category from the Before screenshot above and produce the After screenshot. It’s also worth noting that list views allow two levels of grouped sections. Like the first function this can remove the SecondCategory text. Notice the difference in selectors. Again the text should match exactly the text that you want to remove, in the above Before screenshot the text should be “SecondCategory” to produce the After screenshot. Credit goes to this thread on stack exchange where I was given the answer. This is great for parsing data but our end users hate it and I agree that from an end user standpoint you’re expecting to see choice1 and choice 2 horizontally displayed without the “,” delimiter. This is best abstracted and called as a global function whenever you need it. Also note that other columns types will delimit by other delimiters like “;”. One of the most useful features of SharePoint 2013 is the ability to drag and drop documents or entire directories into Document lists. I’d noticed that this wasn’t working consistently for all of our users and after some looking, there is a plethora of blog posts and explanations for this–so, I’ll add one more to it. The drag and drop feature requires an IE version 10 or greater OR Office 2013. Our current standards for our users were IE9 and Office 2010, so of course they weren’t seeing it. I’m running IE10 and have both Office 2010 and Office 2013 installed for development purposes, which satisfies the requirements for it’s use. Importantly, this doesn’t mean that it’s impossible for users with IE9 or lower or Office 2010 to use it. The simple solution is to install SharePoint Designer 2013 and choose Custom Installation. Deselect everything (including SharePoint Designer) except Office Tools. This will install the correct Active-X control and allow the drag and drop functionality to work.